I am a diehard Yotam Ottolenghi fan. I love all of his books and I am always so impressed with his dishes, especially the flavors he pairs together. 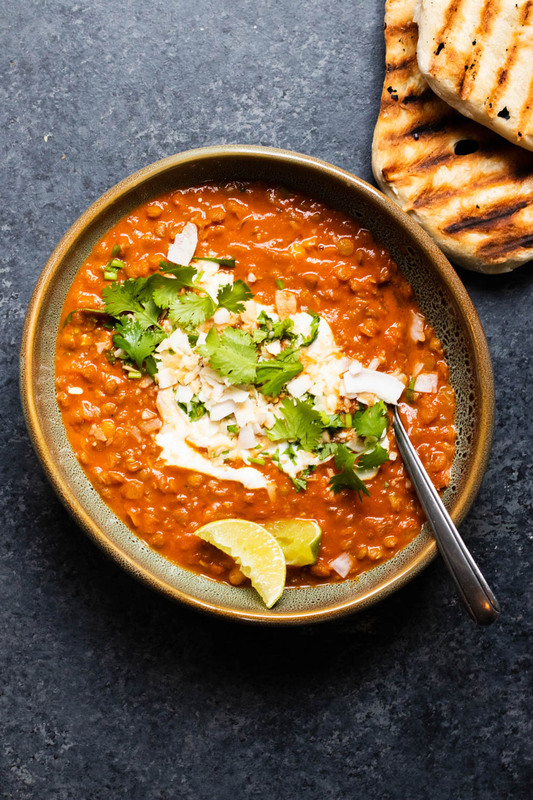 This curried lentil, tomato and coconut soup was inspired by his recipe and it does not disappoint. I have added it to my weeknight dinner rotation because it is easy, healthy, and freezes well. I served my soup with some grilled pizza dough as a fake “naan” but feel free to serve with any crusty bread you can find to soak up all of that goodness. 1/2 cup finely chopped cilantro, plus more for garnish. Melt coconut oil over medium heat in a medium sized pot or Dutch oven. Add the onion and saute until soft, about 4 to 6 minutes. Add the garlic, ginger, and curry powder and continue to cook for another 30 seconds. Add the lentils, tomatoes, cilantro, coconut milk, 2 cups of water, and a big pinch of salt and pepper. Cook for about 20 to 25 minutes or until lentils are soft. Serve the soup in a big bowl topped with more cilantro, toasted coconut, and lime wedges.